Is the Seventh Day Adventist the True Church in the Bible? Are We Being Pretentious? Who Cares?! I found your article very interesting and informative. But (you knew it was coming, didn’t you? 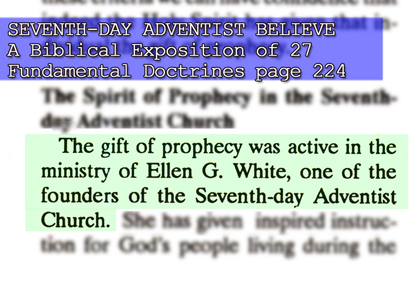 ), I found your statement “The Seventh Day Adventist Church (instead of using God’s name, they used ‘Seventh Day’) apparently proving that they are not of God!” very interesting. Because if you were to look back in the history of the Seventh Day Adventist church, you’ll find that the founders of the church struggled over the name of their newly-founded church. they contemplated names like “Church of God” but ultimately decided that a name like that would be pretentious and instead opted for “Seventh-Day Adventist,” which made no claims of authority but instead encapsulated the doctrines the church held that set it apart from other Christian denominations. I thank you for your polite reply regarding my article; but I disagree to your idea that using the name “Church of God” can be pretentious, if you are in the true Church.In fact, the apostle Paul did not, in any manner, felt pretentious when he said the following statements in 2 Thessalonians 1:4. The first century Christians glory in the Churches of God and never felt pretentious in using such a name. If the mentality of the first century Christians is like the mentality of your leaders, then the truth will never come out and be understood. God calls His people by His name; and not by the name of any day whatsoever. Others may presume that somebody who considers himself a true man of God, pretentious, but, who cares? Those that are of the world are of the world; and they listen to their own.Those that are of God listen to God.No amount of suspicion from the world can stop them doing so. When God said that anybody who uses His name in vain will not be held guiltless, God does not mean that we can not use His name anymore.When the Bible said that enemies of God use the name of God in vain, it does not mean that everyone that will use the name of God is an enemy of God and using God’s name in vain. The apostle Paul used God’s name to emphasize the truthfulness of His preaching. He even wrote that the name of God must be used in naming the family of God in heaven and in earth. Are we going to refrain from using the name of God if we sincerely know in our hearts that we are using it in accordance with God’s will in the Bible?God Forbids! Let us be true to ourselves and to our conscience.The Seventh Day Adventist Church was founded by man, and its name, as you have said, is their option — not of God. I am sorry to say this but, I have to say it: that Seventh Day Adventist is not the true church because it was founded with the leadership of a woman which is against God’s will in the Bible. (1 Timothy 2:11-14)“But I suffer not a woman to teach, nor to usurp authority over the man, but to be in silence.And Adam was not deceived, but the woman being deceived was in the transgression. Next StoryStop! Suicide Is Never a Solution, Period.